Celebrating their 10th anniversary, the Kooks shimmied into the 9:30 Club Sunday night with new material and a revitalized stage show that was eaten up by the sold-out crowd. From the beginning, vocalist Luke Pritchard strutted and slid across the stage, very much looking like he could have sprung whole from the ‘60s music that inspired his lyrical Britpop. Just because you’ve got a sad song doesn’t mean you can’t get diggy with it. Not all songs on the new album are as frenetic as “Down” although they apparently are as equally danceable. The steadier “It Was London” later in the set has a slightly bluesy sound while still being very much of The Kooks. The quartet from Brighton, England, came to play a lot of older material as well. They celebrated their first album, Inside In/Inside Out from 2006, with “Ooh La,” a shimmery piece of ear candy, early in the set. Later, they play the slow, romantic “Seaside,” a nostalgic ode to the beach and a personal favorite. The Kooks’ encore included “Naïve,” a best-selling single also from the first album. The deceptively sweet song really highlights the strong rhythm section of Denton and Nunez, who proved they have seamlessly integrated themselves into the band at this point. The band as a whole looked like they love performing, and they played to the audience very well, very much evoking a classic rock-and-roll show. 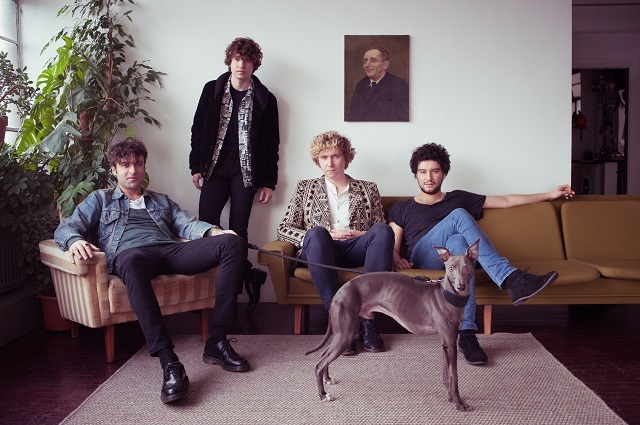 The Kooks hit Terminal 5 in New York City tonight, and then play at Lollapalooza in Chicago this weekend. Catch them and you’re in for a good show, regardless of whether you’re a long-time admirer or you’ve never seen them previously. Opener Clara-Nova, a project of L.A. singer-songwriter Sydney Wayser, also received a warm welcome from the audience. She performed with a full band, recently signed to Sony Music, and performed songs like “Electric,” a catchy upbeat indie pop song. Wayser has a pleasing voice that floats well over her own keyboards, and her band forms a very melodic ensemble with its jangly yet subtly synthy music. Clara-Nova has not yet released a debut album, but I suspect we’ll soon hear more from Wayser and her bandmates. In the meantime, catch them opening for The Kooks and enjoy the opportunity to catch a band in that nascent stage before they headline their own tour.